FileMaker Pro 17 has been released, in what is now an annual cycle. The aims of FileMaker Pro haven't really changed since it was launched in 1985 but its audience definitely has. Now, FileMaker is a platform providing tools for people to make custom apps and improvements in the latest version are chiefly directed at new users. FileMaker Pro 17 tries to make it easier for more people to make more apps - and to do so faster than before. There are apps and there are apps, though. This is not Apple's Xcode. 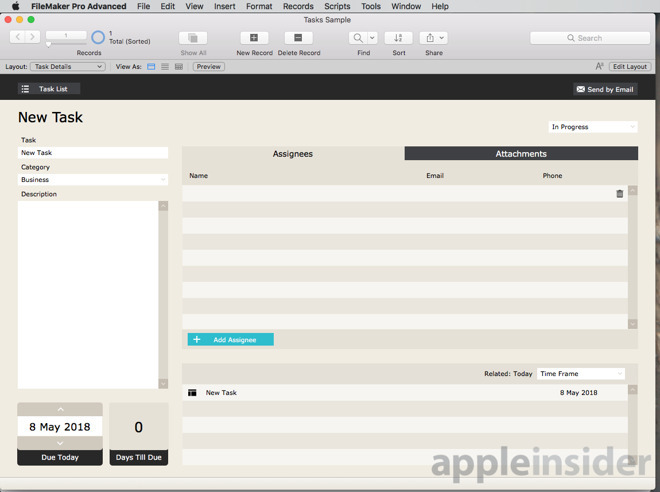 Instead, you'll use Filemaker to make apps for your work and your business. FileMaker Pro is used by one-man or woman-bands, by regional firms and by international corporations. They use it to track stock levels, vacation leave bookings, jobs and customers and more. The whole point of FileMaker Pro is that you create what you need but it will always be a business tool. Really, it's a tool for making databases and it always has been. Apps today are about collecting some information and showing you others: databases are exactly the same. So everything that FileMaker has become over its 30-odd years is suited to making what we now call apps. Calling FileMaker Pro 17 an app development platform is a kind of rebranding but it's a justified one. Recently, those apps you make have become ones that you can use on the web, in the cloud and on your iPhone or iPad as well as on Macs and PCs. You can create, use and manage them all through the different flavors of FileMaker from desktop app to cloud service. You'll start with its sample apps, you'll add to those and then you'll be hooked. There are people who started using FileMaker Pro for one database app and turned developing new ones into their entire career. If you are an existing, long-time, die-hard user then the first simplification in this new version is going to startle you. As of now, there isn't a FileMaker Pro app anymore. 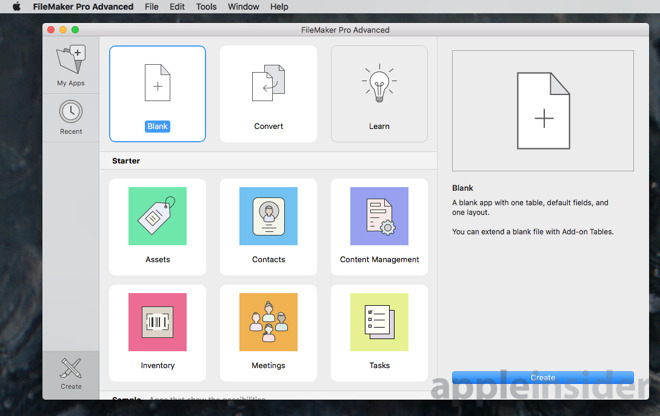 What was the regular app has been dropped in favor of FileMaker Pro Advanced. 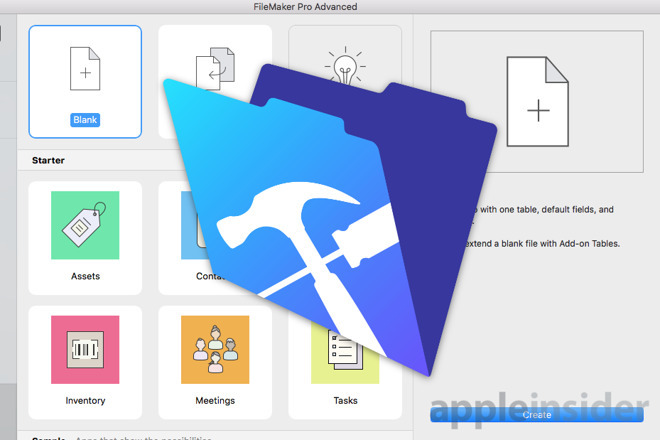 Previously you had the option of the regular Mac or Windows app —and then FileMaker Pro Advanced if you needed extra development tools. Now there is only the Advanced one. That's good because it was always a tricky decision over whether it was worth getting the Advanced version or not: it did add extra features but it cost more. It's bad because Advanced still costs more than the regular version did. Now that you've no alternative, though, if you upgrade to the new version 17 you will relish the extras that Advanced gives you. 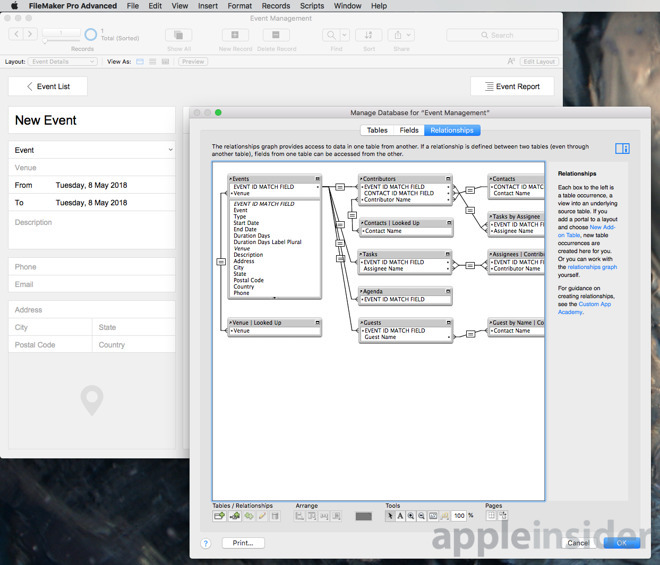 FileMaker Pro Advanced includes various tools for debugging problems and head and shoulders above them all is the Data Viewer. Whenever you make a database app, you'll have data in it ranging from, say, Surname, to something calculated like Invoice Total. Each of these is held in a field, and what's superb about the Data Viewer is that will show you what's in a field at every stage. Say your invoice total is coming out wrong —you can watch each part of the calculation as it goes through and determine exactly where the problem is. That's the real benefit of Advanced —it's great for debugging problems. Oddly, though, you have to tell FileMaker Pro Advanced that you want the Advanced features. Not only is it a preference that defaults to Off, you have to quit and relaunch FileMaker when you switched it to On. You'll never switch them off again, either, but you won't feel the genuine pleasure they give you until you're quite deep into developing apps. 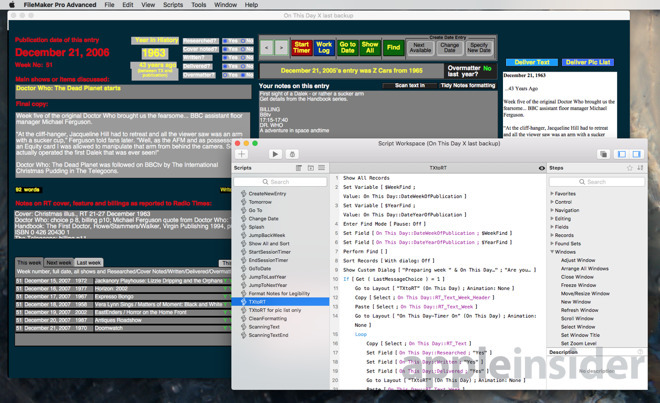 Whether you've been using FileMaker for decades or whether you're brand new, you are going to be creating custom apps from scratch. That's where everyone will see the benefit of version 17's improvements. The old Launch Center, chiefly used for quickly opening your favorite database apps, is gone. 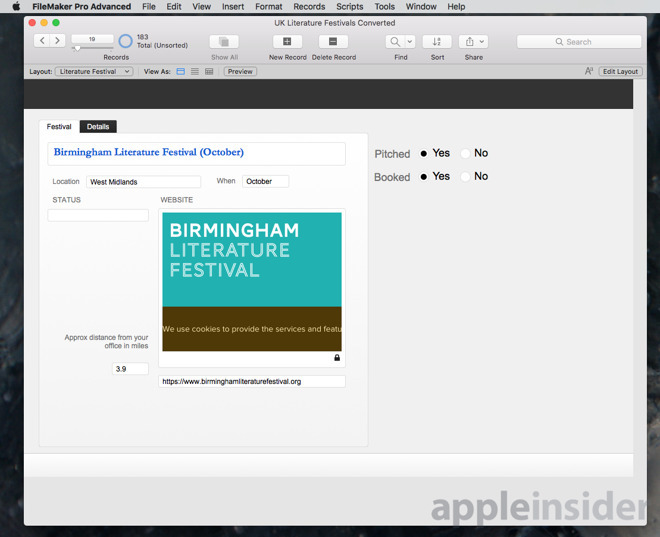 Now when you launch FileMaker Pro you get an initially more basic view of those favorites. It's basic but that simplicity also makes it clearer how you add to those favorites. Where this is all really improved, though, is in the addition of a Create button. Previously to make a new database app or to to use a template of some kind, you had to notice that there was a small dropdown menu at the bottom of the screen and labelled New. It was a menu so you could only choose one item and at the point of choosing, it wasn't terribly clear what the different options were. Now there's a large Create icon. What's more, when you click on it, FileMaker turns the whole dialog box over to showing what you can create and how. Previously there were 16 sample database apps to choose from but where they all remain, they're offered to you underneath two new categories of choices. There's a Starter category that lists 6 new templates. These are all similar to the 16 existing samples but they're more focused. The Tasks Starter one, for instance, shows you how you can layout an app that will let you enter your To Do items. The Tasks icon in the Samples section gets you a complete database ready to enter To Dos into and start working with. Sometimes the difference is subtle but it's that the Starter version is more focused and more for learning how to use FileMaker. The sample versions are more for actually using now and maybe customizing later. If you're the sort to ignore templates and just get on with trying things out, though, there is a further category and it's so good that it's shown at the top of the screen. You need to click on each of the Blank, Convert or Learn icons to get a description of what they do but they are for everybody of all levels of experience. Expert users will just click Blank without a second thought. Brand new users should click on Learn. Yet, it's that middle one that you'll like because what it converts is Microsoft Excel spreadsheets. 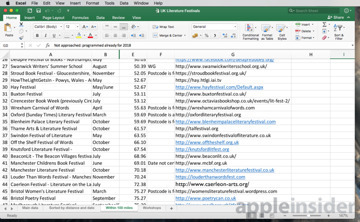 You've done this: you've entered text into Excel and maybe used it to track simple things. You've used it to at most sort a column like prices into order. 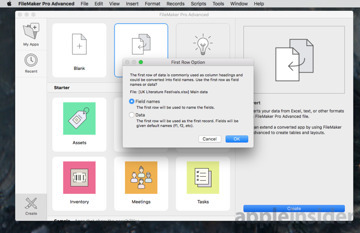 FileMaker Pro 17 Advanced's Convert button takes you through the steps of opening your spreadsheet and determining what to do with each cell. It is very quick but you've got to look at that last image and conclude there was little point doing it at all. 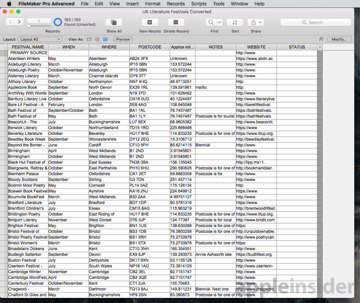 When you first import a spreadsheet in FileMaker Pro, it shows up very much like a spreadsheet. Look at this next image instead, then. This is that same information in that same database, just displayed in a way a database app can. This is one entry in the database with some basic information on the front page and the rest tucked away in the Details tab. It's also a live view of a website right in the center. It took seconds, literally seconds to go from the spreadsheet-like view to a detail page like this. You can now go to or search for any one entry when you need. That website is an example of how a database app can hold more than a spreadsheet ever could. One more thing that's been improved in FileMaker Pro 17 is how rapidly you can add these and how clear it is what you're doing. 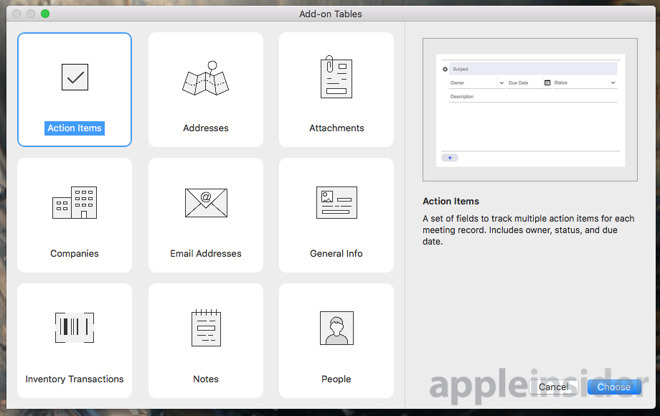 Previously you'll typically have had to think about what are called container fields but now FileMaker offers to create what you need. That can be a space to drag attachments or it can be a place for, say, email addresses. These screenshots so far are all from the Mac version but you use that to create apps you'll run on iPads and iPhones. You still can't actually create or edit FileMaker apps on iPhone or iPad, but version 17 makes more use of iOS. Previously, you've been able to use location geo-fencing to trigger certain actions in FileMaker Go —the name for the iOS version of the app. For instance, you've opened FileMaker Go as you enter your warehouse: it can know to display your stock inventory solution. Now FileMaker Go makes more use of the detailed notifications in iOS 11: it will alert you when you're near a place you've told it you use a custom app. It will also offer to launch that. Plus the new version can use and show you more iPad or iPhone information than before. If you wanted to trigger a FileMaker Go database app to launch only when you hold the iPad at exactly 33 degrees, you could. That level of detail and this degree of customizability makes FileMaker Pro 17 exceptionally useful and powerful. That very same detail and customizability also makes it daunting to some, and impenetrable to others. FileMaker Pro has been described as easy to use, but these things are relative. It's more accurate to say that it's easier. Easier, in how alternatives such as Microsoft Access are far harder to use but now also easier than it was in previous versions. You're still not going to download the software and create a full-custom app this afternoon. However you are able to download the software and create a rudimentary one in under ten minutes. You are highly likely to get hooked on it, too, which means next year you'll be waiting keenly for these small but key improvements to all it can do. Working out the cost of FileMaker Pro for you and your company is still complicated: there are volume and upgrade discounts plus ultimately you'll make choices between using the cloud or buying servers to host your apps. Speaking of next year, you could buy FileMaker Pro 17 Advanced today and in around twelve months plan to buy version 18. In other words, you don't have to subscribe —but the company does make subscription ever more compelling. For instance, the dropping of the cheaper non-Advanced version of the app is another step toward convincing you to subscribe. To buy FileMaker Pro Advanced 17 outright for just yourself, not a team, costs $540 where last year's FileMaker Pro 16 was $329. However, only a fraction of people are going to be using FileMaker Pro Advanced on their own. Most will be in companies where there are many people working and if you are an individual, you're probably developing FileMaker Pro apps to sell. Developers need to keep up with the latest versions and everyone else will find it easier to subscribe and so automatically get those updates. In that case, the cost starts from $15 per month. All of this remains but this year's release has improved how quickly you can get to grips with the software. 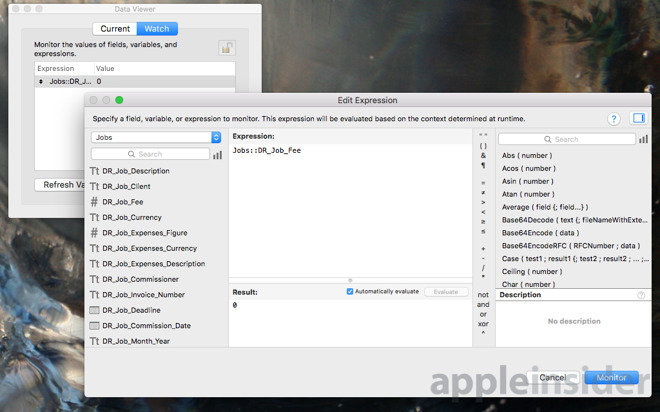 Simply by removing one version to leave you with only the choice of FileMaker Pro Advanced cuts down the head-scratching a little. The FileMaker Pro 17 platform starts from $15 per month per user and encompasses identical Mac and Windows versions plus FileMaker Go for iOS, as well as FileMaker Cloud and FileMaker WebDirect for hosting custom apps remotely.